Here today… Gone tomorrow! Laser Treatment to Remove Age Spots and Sun Spots is Effortless, Comfortable and Safe. Tired of trying to cover up those spots? With just a few virtually painless laser age spot removal treatments, you’ll go from spotted to clear and even-toned. Imagine leaving your home without using foundation or concealers! Watch the video : What is laser age spot removal? However, years of sun damage, poor diet, systemic inflammation and exposure to smoking can wreak havoc on the skin and produce unsightly brown spots and lesions. Fortunately, AMA Regenerative Medicine & Skincare has an extensive selection of advanced lasers specifically engineered for treating all sorts of discolored skin, including sunspots, age spots, liver spots, birthmarks, melasma, and colored tattoos. These laser treatments are unique in that every treatment is customized specifically for each individual patient. The protocols are designed to interact with the body’s natural physiology directing it to safely dissolve and remove the treated pigment. AMA Regenerative Medicine & Skincare’s unique protocols also moderate your body’s melanin level and cell turnover rate, which is responsible for skin renewal. It is the cumulative effects of sun exposure that allows for a much higher risk of sun damaged skin. UV exposure “triggers an excess production of melanin, the natural pigment in our skin, resulting in “solar lentigos”, AKA sunspots, age spots, or liver spots. These spots can appear in varying places on your body such as your hands, face, chest or back. However, the sun is not the only trigger that can cause changes within the natural pigment of our skin. Hormonal fluctuations and a condition called Post Inflammatory Hyperpigmentation (PIH) also play a critical role in skin dyspigmentation. The majority of the skin cells within the epidermis form a protective layer, but about every eighth cell is a melanocyte cell. 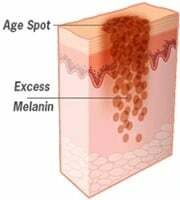 Melanocyte cells are responsible for the production of melanin. Melanin is produced at the bottom layer of the epidermis, on the border between the epidermis and the thick dermis that lies below it. The process of creating new melanin and pigmenting the skin resembles that of an assembly line. First a trigger occurs – the sun, inflammation, injury or hormones – this sends a signal to the melanin-stimulating hormones. After this message is sent, the enzyme tyrosinase is activated. 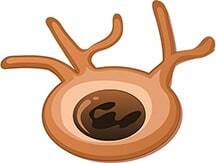 Once tyrosinase is signaled, the melanocyte cell receives a message to produce pigment. The melanocytes make melanin and package them into little bundles known as melanosomes. The cells then disperse excessive amounts of pigment upward through the dermis, resulting in hyperpigmentation. As the skin ages, the cycle is less controlled (sun exposure and hormonal changes interrupt it), and the normal and steady distribution of melanin becomes more irregular and “clumpy”. As excess melanin is produced, hyperpigmentation forms, creating dark spots on the skin that stay indefinitely unless treated. At AMA Regenerative Medicine & Skincare we use a unique combination of lasers whose energies are gently absorbed by the extra pigment (melanin) which stimulates your skins natural “melanin turnover” system which removes old melanin and replaces it with new evenly toned skin. All brown spots are not created equal, so it is vital to properly identify your brown spot and customize your treatment accordingly. Depending on the type, depth and density of your pigmentation, from age spots to birthmarks to melasma, we have an array of 5 different types of energy-frequencies that are emitted from lasers and three different kinds of energy pulses, making 15 different possible laser energies that can remove all hyper-pigmented discolorations. Do not use any products on your skin that irritate, stimulate or exfoliate your skin. Generally speaking, the energy levels used for this treatment are relatively low. The frequencies of energy are customized and very precise, but the level of power used is low. You will barely feel it… and with a little bit of topical anesthetic, you won’t feel it at all. Immediately following most laser removal procedures, patients will experience some redness and slight swelling of the treated area, which usually dissipates within a few hours, though in rare cases may last a few days. The pigmented spots typically change color. Some will get slightly darker and others may turn an ashen color. This is an indication that the laser energy was successfully absorbed into the melanin. To enhance results and promote the long-term health of your skin, specially formulated medical-grade moisturizers, exquisite skincare products and makeup (if desired) are applied to the treated area immediately after each procedure. Additionally, hair growth may be temporarily impaired in the treated area, although it is not the intended purpose of this particular treatment. 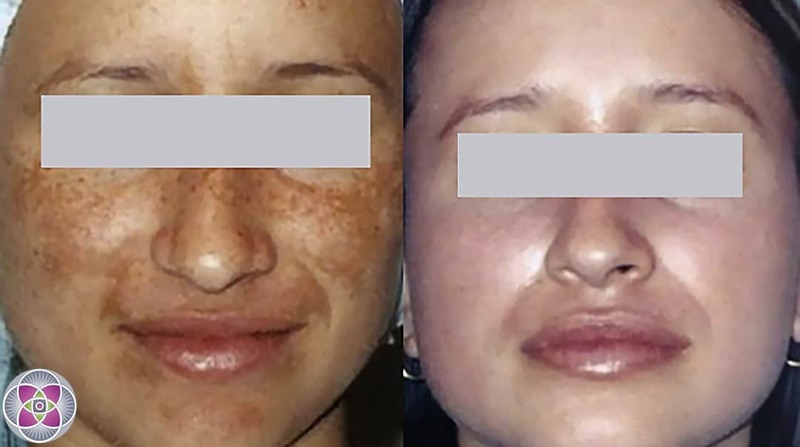 Pigmented skin lesions such as age spots due to sun-damage and other factors begin to show results within a few days after the first laser treatment. Some of your spots may flake off your skin in 3-7 days, while other spots will gradually fade. For darker and well-defined spots in which the melanin is close to the surface, 2-3 treatments are typically sufficient to correct the condition. These brown spots on the skin often turn slightly darker and “grayish,” becoming “crusty.” Then they simply flake off in 3-7 days, leaving perfectly virginal skin underneath. For larger pigmented areas in which the melanin is deeper and irregular, such as melasma or pigmented birthmarks such as café-au-lait birthmarks, progressive fading will accumulate over 3-6 successive treatments until the spots are removed. Q. What are pigmented skin lesions? A. Pigmented skin lesions such as sunspots, age spots and liver spots are areas of skin that have higher than normal levels of melanin making them darker than the surrounding skin. They appear as brown spots on the skin. They are usually the result of aging and/or sun exposure, on in the case of melasma, these brown spots are also influenced greatly by hormonal fluctuations. The most common pigmented skin lesions that people have are sunspots, age spots and liver spots; people can also create man-made pigmented skin lesions in the form of tattoos. The appearance of sunspots, liver spots and age spots can present themselves as brown or dark spots on the skin in a variety of locations such as the arms or face, tend to vary in shape, size, and depth, and can appear to be flat or slightly raised. Although the majority of these brown spots are harmless and only a cause of cosmetic concern, some sunspots or moles can be precancerous, making their analysis and removal a medical necessity. Q. What is the difference between an age spot, sunspot and liver spot? A. Though the underlying causes might differ for different patients, those three names are essentially synonymous. They all treat effectively and easily. Q. How are age spots, sunspots and liver spots treated? A. Pigmented skin lesions such as sunspots, age spots and liver spots are effectively treated by medical lasers. The laser that will be used for the sunspot, liver spot and age spot removal depends on the kind of brown spot the patient has, and the shape, size, and depth of the pigmented skin lesion. 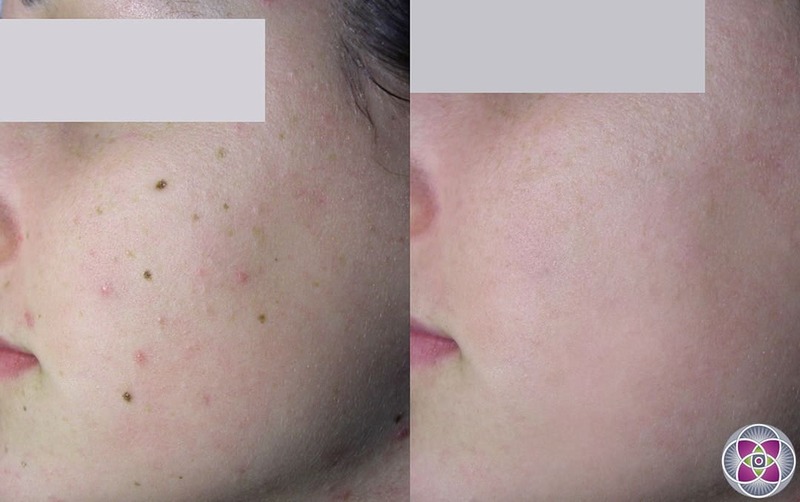 For each kind of pigmented lesion a customized age spot removal protocol has been developed that utilizes specific lasers that engage the body’s natural physiological processes that regulate the skin’s melanin content and turnover. In this way the body itself is stimulated and directed to eliminate the brown spots on the skin. The “partnership” between our scientific protocols and the body’s natural physiological mechanisms is the magic that produces the safest and gentlest treatments and superior results. A.We charge by time. Therefore, the size of your spots, and the complexity of the lasers we need to use to treat it will determine the time necessary and thus the price. Q. Is the treatment permanent? A.Depending on the underlying medical conditions and lifestyle factors causing these pigmented lesions, periodic maintenance removal treatments may be needed to keep your skin spot-free. Q. Is the treatment performed by a doctor? A. Depending on the complexity of the dyspigmentation, either a doctor or highly trained RN will treat the patient. The protocols are always set by the doctor for the RN to follow. Q. Can you remove age spots on the hands?